How do you please vegans and meat-lovers alike? 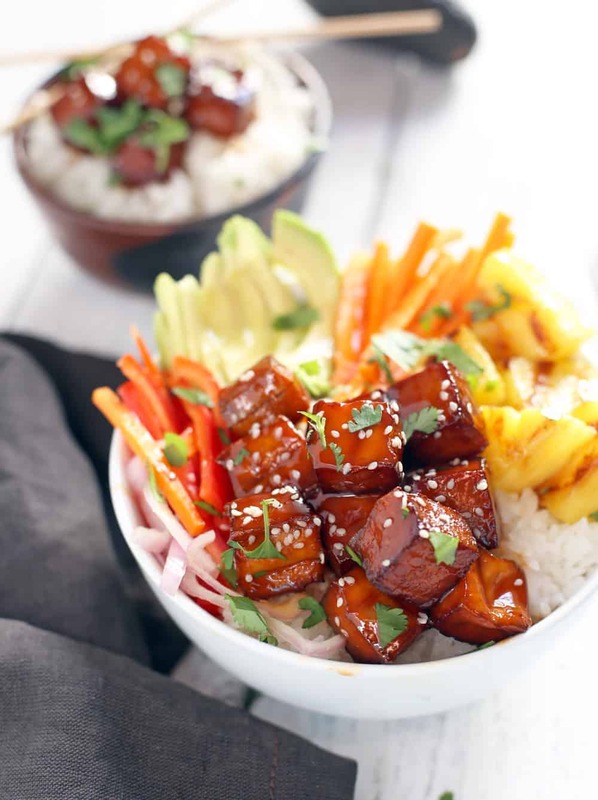 With Smoked BBQ Tofu Bowls with grilled pineapple, that’s how! We all know that my husband lives and breathes for meat. But he married a woman who, during the first few years of us dating, was a pseudo vegetarian (meaning I tried my best to follow the rules but cheated from time to time with seafood and occasionally poultry). It took a long time (around 10 years) for me to finally come around to trusting meat (read: Sean bought a smoker and started sourcing great and trustworthy meat and cooked it like a boss!). And, while we do cook a lot of meat around these parts, we also eat our veggies. It’s all about balance, folks! We also have several friends and neighbors who are vegan or vegetarian, yet still wish to partake in the magic of smoked foods. So to be inclusive of all of our foodie friends (regardless of their dietary restrictions) while satisfying the die-hard carnivores, we have Smoked BBQ Tofu. Seriously, the colors! And the flavors! And it’s smoked! And HEALTHY! We’ve been smoking a lot of tofu here lately trying to come up with more vegan and vegetarian recipes (ok well at least I have been), and so far this is one of our favorite methods. 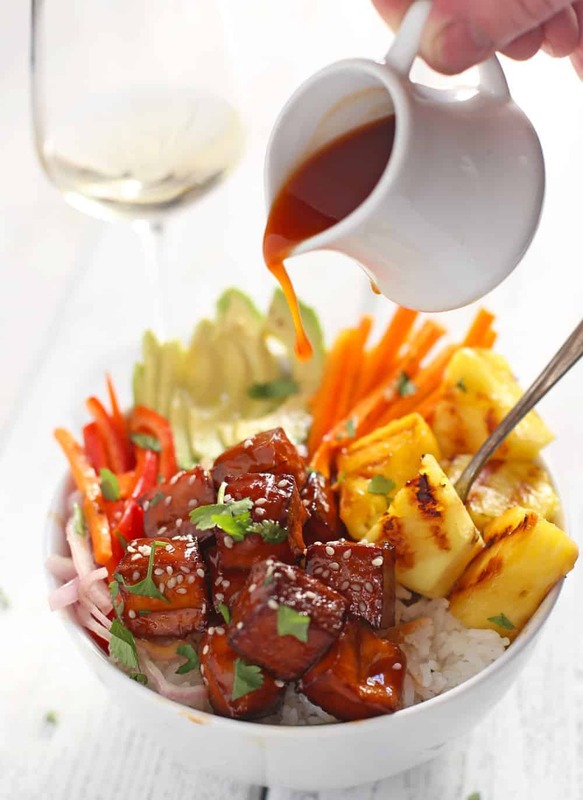 We’ve done a few “burnt end” style tofu recipes to serve along traditional BBQ side dishes, and they’re great (and likely to be making an appearance here soon), but I loved the combination of the BBQ sauce with the grilled (or smoked) pineapple, veggies, and coconut rice. That’s right, coconut rice. That’s just a fancy way of saying I used coconut water in place of regular water (or stock) to cook the rice in. It gives it a great (yet mild) tropical flavor to go with the fruit and sweet BBQ sauce. So any tofu lover knows that we start by pressing the tofu. If you’re unfamiliar with this process, it just means that we need to press out the water. Tofu comes packed in water, and you need to get out that bland liquid so that you can introduce good flavors (like a marinade, or BBQ sauce). Think of it like a sponge that you need to gently ring out the liquid before introducing new flavors, or otherwise when you cook it, it’s mushy and bland. So take your tofu and discard the water from the packaging. Then slice it down the middle, lengthwise, creating two pieces 1-inch thick. Lay out a baking sheet or large flat plate and line it with a few paper towels. Place the tofu on the paper towels, then layer with some more paper towels. 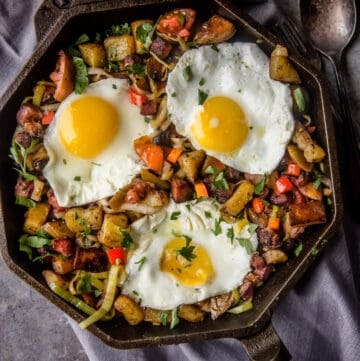 Place another plate or baking sheet over the top, then place something heavy on top of that plate/tray (like heavy books or like here, a cast iron pan). Leave it for overnight or at the minimum an hour. Uncover, then cut into 1” cubes, then place those pieces in your marinade. Next (and this step is totally optional! ), you can marinade in some Miso or BBQ sauce. Our vegetarian neighbor gave us the Miso idea to add more savory/umami flavors. It totally works to add some savoriness and added flavor to the tofu. But if you don’t feel like buying this extra ingredient, then you can marinade it in your favorite BBQ sauce. OR if you don’t have time to marinate the tofu, then feel free to skip the step, because the real flavor is yet to come. Place the tofu in the marinade in a bag and let it sit in the fridge for 30 min to an hour. Then it’s time to smoke those bad boys! 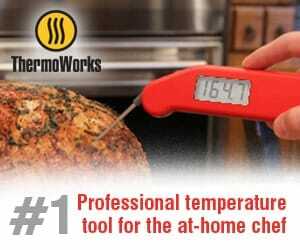 Prep your smoker to 250 degrees Fahrenheit. We like fruit wood for this (like cherry). 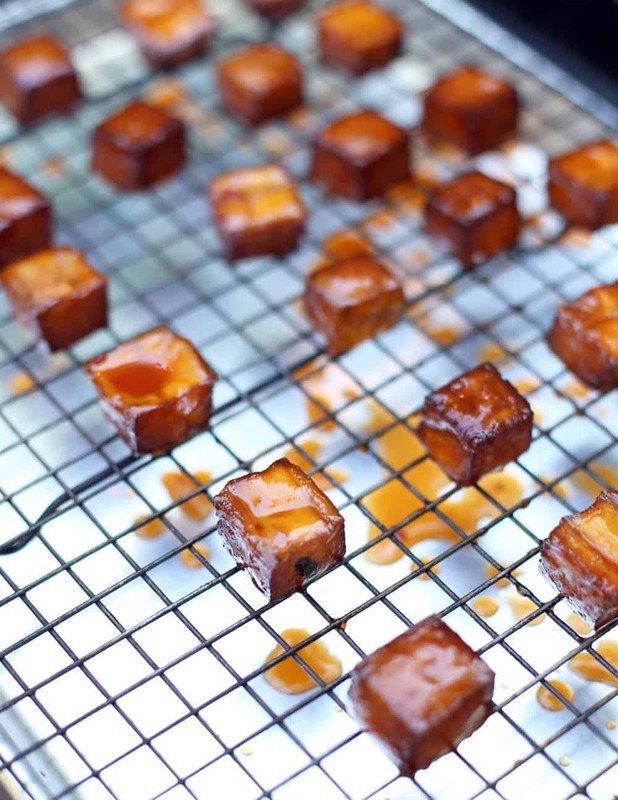 Place the tofu directly on the smoker, or on a thin wired rack, for about two hours (up to three) or until you get a firm exterior with dark color. If you marinade in a sugary bbq sauce, it’ll firm up faster, so try to go light on sugar in your flavor early. Then touch to test for firmness. 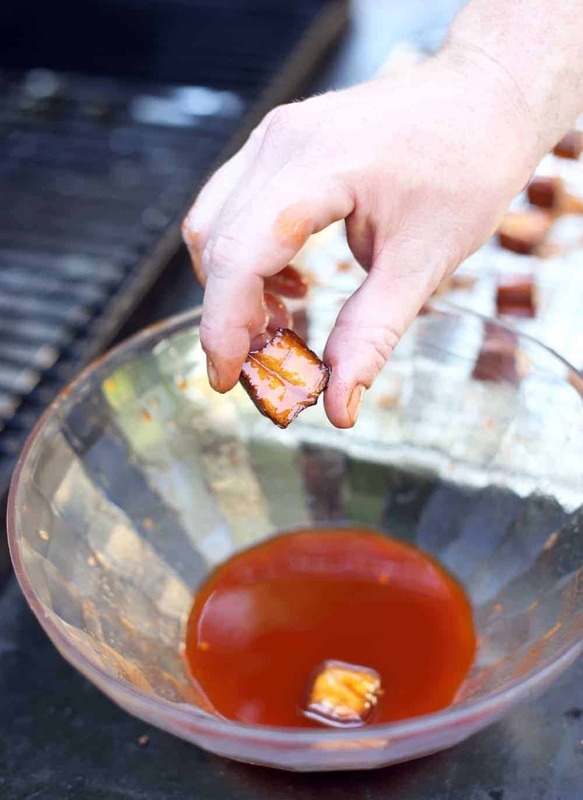 When you’re ready, dip your tofu cubes into the BBQ sauce for a quick BBQ bath. Get them all nice and sauced up, and then place them back on the smoker. You can also brush the BBQ sauce on with a paintbrush, but you’ll have to rotate to get all 4 sides. The dipping method is super quick and easy. 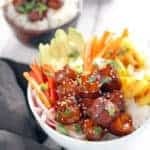 *Note that depending on the style of BBQ sauce you use, the tofu may caramelize sooner. We used a Carolina style sauce that isn’t too sweet. If you opt for a KC style, or sweeter style (tomato or ketchup based), then keep an eye on the tofu as it may caramelize sooner. During this final round you can add your pineapple chunks that have been skewered. You can also do this separately on a hot grill (actually it’s best on a hot grill for quick searing). 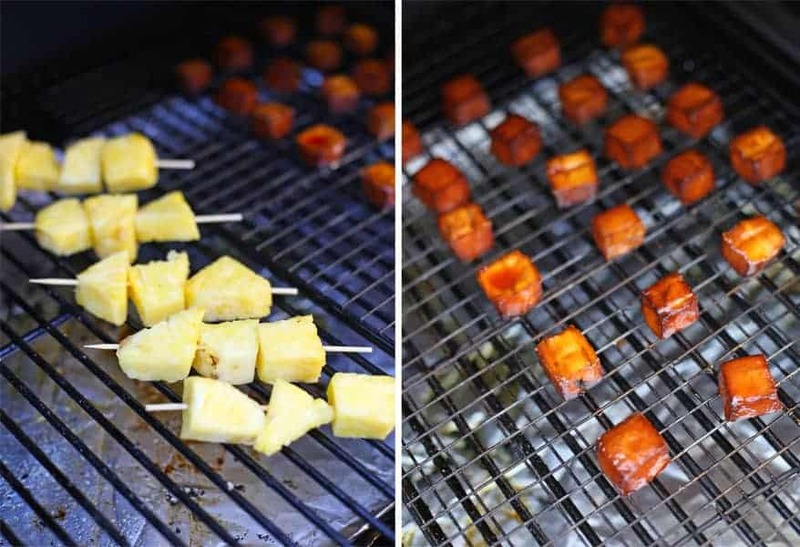 Leave the pineapple chunks to cook about 3-5 minutes per side, depending on how hot the grill is. Just look for some grill marks and some mild caramelization on the fruit. After your tofu is done setting with the glaze (about 20 more minutes on the smoker), remove from the smoker and let them take one more happy dive into the BBQ sauce before serving, just for a nice sheen. Assemble your smoked tofu bowls, and you’re good to go! A smoked dish that everyone can agree on! Feel free to add more BBQ sauce at the end for the tasty coconut rice to soak up. *Note this tofu is also great in a sandwich, or served alongside your favorite BBQ side dishes. But seriously, look at these bowls? So nutritious AND deeeeelicious! An easy and delicious (and healthy!) 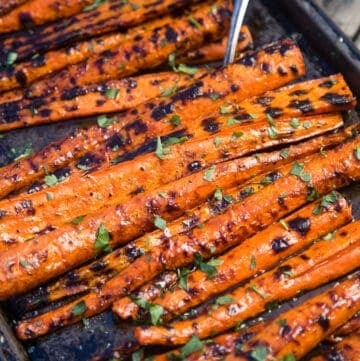 vegan and gluten free recipe for the smoker or grill. 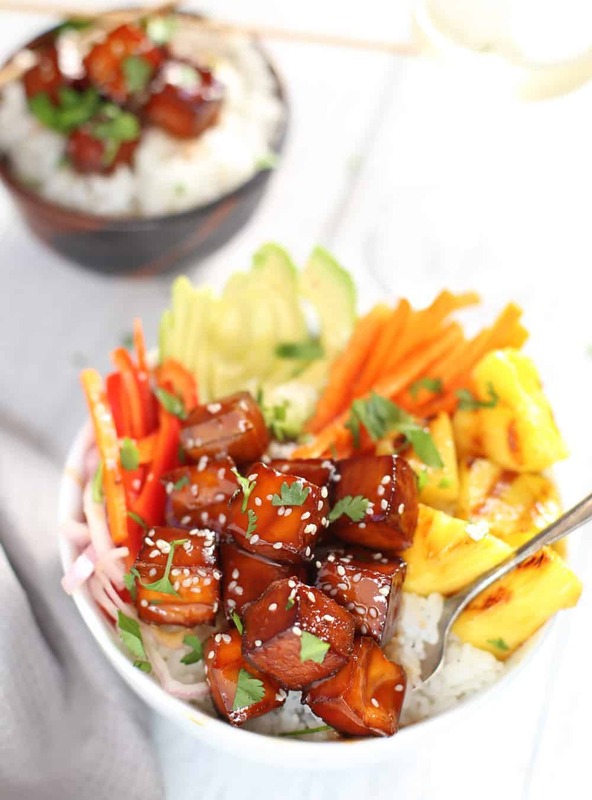 Smoked BBQ Tofu bowls will please vegans and meat lovers alike. Drain the tofu, and then press the liquid out of the tofu. You can do this with a tofu press or the old fashioned way, by layering a large flat dish with paper towels and place the tofu on the plate. Layer the top with more paper towels, then place a heavy object over the top (cast iron skillet, heavy pot, etc). Let sit at least 1 hour to press the liquid out. Prepare your miso. 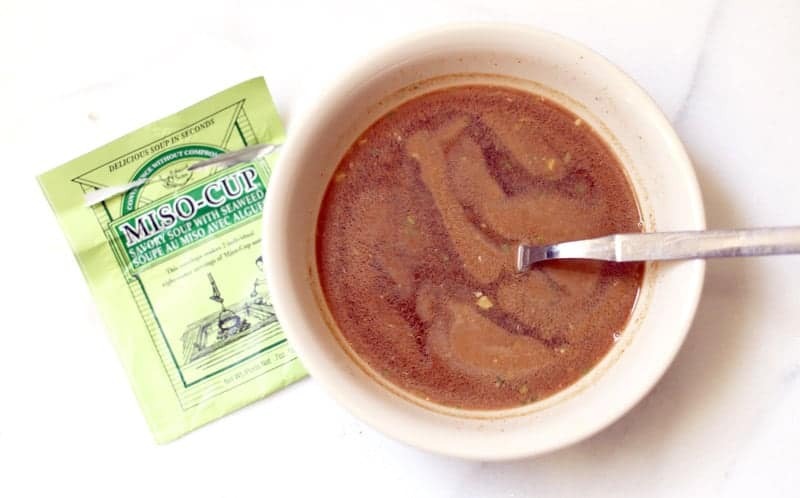 Place 1 tablespoon dry miso soup mix with 8 oz warm water. Place in a large freezer bag. After pressing, cut the tofu into 1” pieces and add to the miso marinade. Place in fridge for 30 minutes to marinate. Prep smoker to 250 degrees, look to use some kind of fruit wood (like cherry, apple, etc.). Drain the tofu from the marinade and toss in ½ cup of the BBQ sauce. Place on smoker for up to two (and up to three) hours. 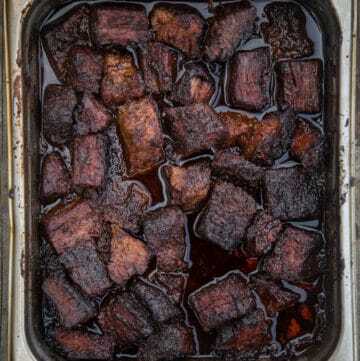 Once the tofu starts to feel a bit firm to touch on the outside, remove from smoker and place in a bowl with the BBQ sauce to coat, then put back on smoker for 20 more minutes or when the glaze sets. Meanwhile prep the other ingredients. Cook rice according to package instructions, using coconut water instead of regular water. Slice and prepare your vegetables. Once the glaze has set on the tofu (sticky), remove from smoker and toss one more time in BBQ sauce for shine. Add rice, smoked tofu, pineapple, avocado, and other vegetables. Garnish with cilantro. Drizzle with additional BBQ sauce if desired. This recipe can easily be adapted if you don't have a smoker or grill. Just marinate the tofu directly in the BBQ sauce prior to pan searing the tofu. Cook it up in a skillet for a few minutes on medium-high heat until a nice crust forms. It won't have the same smoke influence, but it will still be delicious! We’ve got some fun flavors going on here, from the BBQ sauce, the sweet pineapple, the flavorful rice, crunchy veggies, and creamy avocado. We’re really focusing on the style of BBQ sauce you choose and something that will stand up to any sweetness of the sauce along with the tropical flavors from that pineapple. While a fruity rosé is ever and always a good standby for these BBQ flavors, I also think it’s a great match for refreshing fruity whites like Riesling or a sweeter style Müller-Thurgau (which is what we paired it with here, from Sokol Blosser). While I would avoid most reds because of those dominant pineapple flavors, I do think it would be pretty awesome with Lambrusco — The very mildly sparkling red from Italy’s Emilia-Romagna region — but not the sticky-sweet kind you may be thinking of. I’m talking a dry or perhaps one with a touch of sweetness. Good fruit, good acidity, good potential with these awesome flavors. Yum. There’s still time to vote for the Wine Blog Awards. Vindulge has been nominated for BOTH Best Original Photography AND Best Overall Wine Blog. 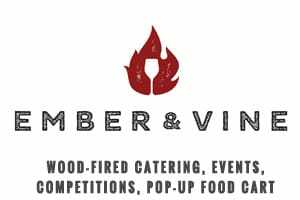 We’d love your support in voting for us!! Voting ends June 13th. You can vote HERE. Your pictures are gorgeous. I’ve never tried tofu before but this makes it look good! Thank!!! It’s pretty easy to work with, and is like a blank canvass, you can make it taste like whatever you want. And filled with protein! You’ve made tofu look absolutely delicious!!! Thanks!! And thanks for having me over on #thursdaytourspdx!! Thanks! Like I mentioned, we have a lot of friends who come over for bbq’s, and while we do still usually provide some meat items, it’s always nice and welcoming to have some other offerings that people can actually eat (besides store-bought stuff or generic things). It’s also nice for us to take a break from meat every week, and finding nutritious and delicious things to nourish our bodies. 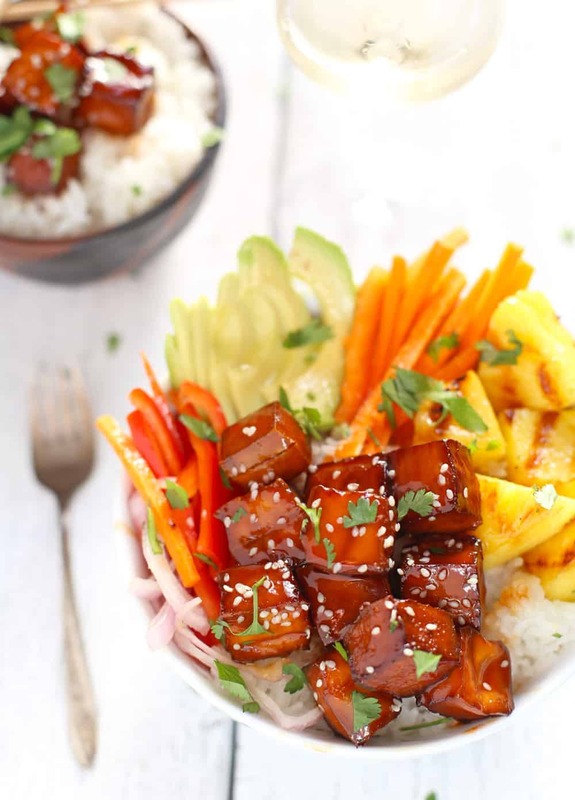 That shimmering tofu is calling my name – You captured these bowls beautifully. 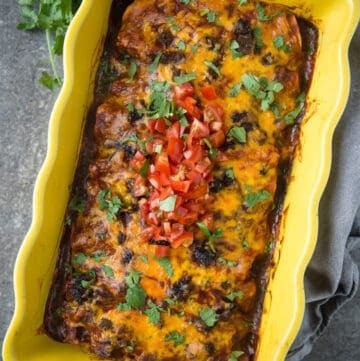 What a great BBQ dish for the non-meat lovers out there! 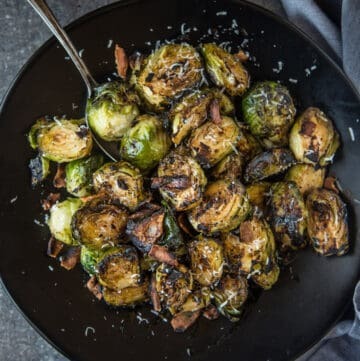 A great recipe just in time for dinner! How have I never thought of making rice with coconut water?! That is a genius idea. I also really like the idea of using a wired rack on the grill so the tofu doesn’t fall through. Does any wired rack work or do you have to find specific ones to handle that much heat? Thanks! I used to just use chicken or veggie stock for cooking rice but I tried coconut awhile back and it worked like magic. It adds some great flavor and cooks the rice just like water or stock. So good! As far as the wired rack, I just use a regular wired cooling rack. Since we’re smoking the meat at a lower heat it didn’t really matter what rack we used. Just one that isn’t too wide, so the tofu actually stays on the rack (and doesn’t fall through the gaps). But any oven safe rack should work just fine. Gorgeous photos!! Coconut rice sounds delicious, great idea to make it at home! Could serve it with mango like they do at Thai places. We often cook rice in homemade bone broth for extra nutrients but I hadn’t though to do it in any other liquids! I don’t eat soy or processed foods for health reasons but I love the idea of mixed bowls like this! I should get more creative with fun things to add like you did with the sides! 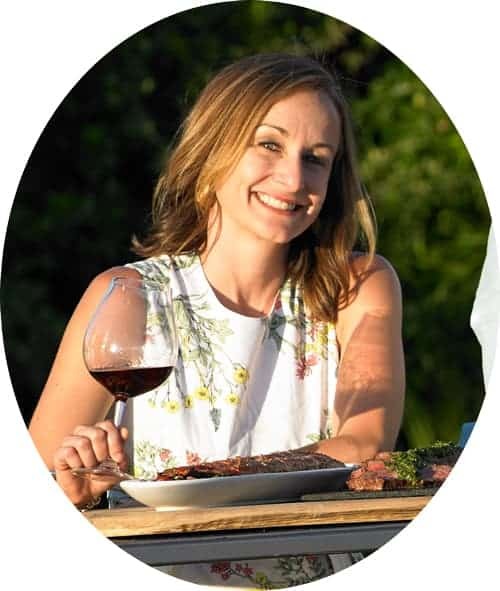 Funny, my husband got me to change my longtime vegetarian and vegan ways with local, high quality, healthy meats, too–thank goodness! I am in LOVE with the idea of smoked/barbecue tofu. It sounds amazing! You always come up with the most deliciously delightful creations. I have some hard tofu in the fridge, so you know what I am making this weekend. Wahoo! Thank you. Cheers! This looks like possibly one of the best vegan recipes I’ve seen. Grilled pineapple is just delicious. Only problem is……I don’t have a bbq. Would the tofu cook in a semi-similar way in the oven or fried in a pan? I’m actually going shopping to get what I need, right now! Hi! Thanks so much for the comment! Yes, this would totally work pan fried. The tofu isn’t going to have that true “smoked” flavor, but you can still achieve a delicious flavor with this dish. Prep the tofu the same way, but when it comes time to cook it just toss some olive oil in a wok or non-stick pan and cook up your tofu on med-med/high heat until it starts to get a nice crust. Then toss in your BBQ sauce and let it cook a few more minutes. It will then start to caramelize, so pay close attention to it. When it forms a nice crust, pull it off and serve the same way. I want to try this dish, look delicious! Question – do you cook your veggies at all, or do those go into the bowls raw? Thanks! Roger great question, we tend to eat the veggies raw, sliced really finely. But steaming or blanching some of them works too, depends on how you like the texture or flavor! What do you do if you don’t have a smoker? Can I use miso paste instead of miso soup mix for the marinade? Yes you can use miso paste instead. And if you don’t have a smoker, you can cook the tofu at a low temperature in the oven, or pan fry.